An excellent space adventure slightly hindered by its short length. It seems that a Crusher's work is never done. While taking some well-earned time off on a tropical vacation, Joe and his companions are called to duty by an urgent situation. An industrial accident in space has altered the trajectory of a frozen comet orbiting the planet Kabara, threatening to send it crashing into the planet's surface. To make matters worse, the comet is being used as a slave labor camp for political prisoners by a cruel dictator on the planet, Ghellstan. If the comet collides with Kabara, not only will it kill everyone on it, but it could cause massive damage to the planet itself. Joe and his crew are quickly dispatched to Kabara and tasked with altering the comet's trajectory away from the planet, averting the disaster and sending it harmlessly into space where the prisoners can be safely rescued. On their way to the planet, the Crushers bring up a valid question: Why would Ghellstan put so much effort into rescuing his political enemies when this would appear to be the perfect opportunity to get rid of them? At first it appears the rescue efforts are simply a tactic intended to boost Ghellstan's popularity, but the truth turns out to be far more sinister. Ghellstan and his security forces want the rescue efforts to fail and everyone involved in them to be killed--including Joe's team. Soon after their arrival, the government forces deliberately sabotage the Crushers' operation. Suddenly the Crushers find themselves in a desperate battle against two seemingly unbeatable opponents, the forces of nature and the military forces of Ghellstan. Can Joe and his companions find a way to rescue the Ice prison inmates and hold off the Ghellstan's military, or will the frozen comet become Joe's tomb? This sequel OAV to the 1983 Crusher Joe movie is a superb episode, nearly on par with the original. It takes the "good guys vs. bad guys" theme and adds the twist of conflict with nature on top of it, for some classic disaster movie flavor. It has the interesting characters, great animation, and excellent action scenes of the original, and to mix things up a bit Joe himself isn't the one doing most of the shooting in space, so his crew get plenty of screen time and aren't just stuck playing support roles. The only real flaw is that it's only 59 minutes long; the story is, as a result, not particularly complex and the whole thing feels a little rushed. It also would have been nice to spend a little more time on the frozen comet of the title, which had more potential as a setting than it took advantage of. 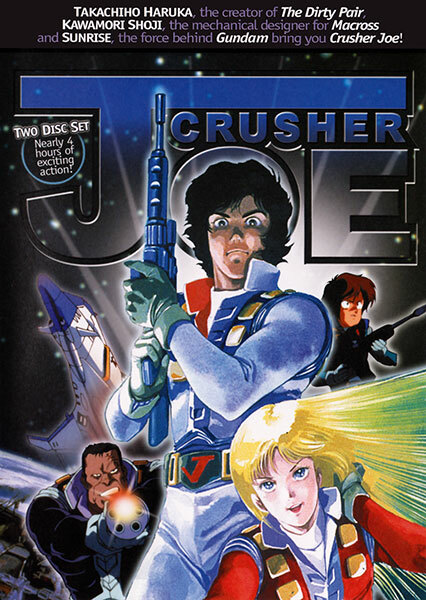 Despite its short length, this OAV gives fans of the original Crusher Joe movie everything they could possibly want. It just ends way too quickly and leaves you begging for more. 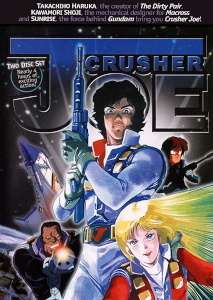 Crusher Joe: The Ice prison is a sequel to the 1983 movie "Crusher Joe." This piece of work was released six years later and involved a different director. It still basically feels the same, but this time around, the story has a new twist. While the original movie was basically a "good guys vs. bad guys" action flick, this OAV episode combines two movie elements: combat against human opponents and conflict against nature, similar to disaster films like "The Poseidon Adventure" and "Armageddon." Despite time constraints, this combination works out very well, and benefits from the additional aspect of having the government attempt to sabotage rescue efforts instead of overseeing them. The final result is a superb OAV episode, nearly on par with the original movie. The only thing that holds it back is its short 59-minute run time, which makes certain aspects feel rushed and moves some of the more interesting parts along too quickly. The main things that make this OAV episode great are basically the same as the original movie. Interesting characters, great animation (for its time--keep in mind this was released in 1988), and excellent action scenes. This time around, the main focus of the film isn't just the battles waged by humans, but also the desperate battle against the elements by Joe and his crew, a battle mainly waged by Joe himself. One key distinction from the movie is that in this show, Joe is only a minor participant in the space fight scenes. They are primarily fought by his crew members, Alfin, Talos, and Ricky, while you can count the number of times Joe fires a weapon on the fingers of one hand. Instead, he takes charge of the rescue effort on the Ice prison while his crew takes on Ghellstan's military forces. This actually works out really well. First of all, Joe's effort to rescue the prisoners of the frozen comet has just as much entertainment value as the shootouts and space fighter duels. And, second, it ensures that he doesn't hog the spotlight too much and relegate his crew members to secondary roles. A lot of movies and TV series, both animated and live action, make this mistake, but not only are Joe's crew-mates given plenty of screen time, their roles and actions here are just important as his. As one would expect from a 59-minute show, the story isn't too complex. There is only one big twist, and it is hardly surprising seeing as it's mentioned on the back of the DVD box. But even so, it still deals with the twin story arcs of the rescue operations on the Ice prison and the battles in space very efficiently. Also, the action scenes succeed at being entertaining and competitive without being too far-fetched. Joe and his crew-mates face plenty of near-impossible challenges against foes with massively superior numbers, but it never felt like they were single-handedly wiping out entire armies and space fleets or pulling off superhuman miracles every few minutes. As mentioned earlier, the main problem with "The Ice Prison" is its short length. Many of the action scenes and story segments feel rushed, and I think they could have been a lot better with more time to develop. One example is a scene where Joe's crew-members have to escape capture aboard a Ghellstan military ship. This scene starts out pretty exciting, but it's over way too fast and doesn't have the chance to develop into an epic escape like the flight from the Death Star in Star Wars. Another problem is that we don't get to see much of the frozen comet itself. With a title like "The Ice Prison," you would think that's where most of the film takes place; it doesn't. Most of the action is in space, with ships and starfighters; there is only one shootout, and it takes place on board a ship. Meanwhile, most of Joe's rescue efforts inside the frozen comet are in one tiny section that seems like a standard cave in a winter environment. This doesn't mean the main environments in the OAV are boring or uninteresting, but the neglected Ice Prison seemed like a great place for some excellent scenes, a wasted opportunity to say the least. Also, don't look for any character introductions or development. There wasn't much in the original movie, which was over 2 hours long, so it's unsurprising that there isn't any here. This episode simply starts us out with a shot of Joe and his crew-mates on vacation and then sends them right on to their mission. 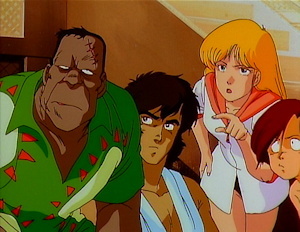 It obviously fits right in with the other Crusher Joe OAV and the movie; other similar sci-fi action stories include the weirder, cheesier Space Adventure Cobra and the much more action-oriented Dirty Pair movies and TV series. 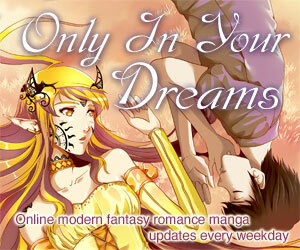 Based on a series of novels by Haruka Takachiho, who also created the popular "Dirty Pair" franchise. This OAV episode is available from AnimEigo with another Crusher Joe OAV and the original movie as set. There aren't a lot of special features, but the fairly low price of the movie and two OAV episodes in one set makes it an excellent bargain. Somewhere in the 13-up range on account of a modest amount of sci-fi violence. Violence: 2 - Other than one bloody shootout, the violence is pretty mild. Language: 1 - Mild language. Crusher Joe: The Ice Prison is Copyright © 1989 Takachiho & Studio Nue - Sunrise, Inc. Any images are the property of their respective rightsholders, and included for review purposes only under the fair-use clause of US copyright law.